Stand erect and take a few deep breathes. Imagine that a shower of light is cascading down from high above. This light will pass straight through your body and auric space, cleansing and removing the tensions and any pains as it does. This meditation is great fun to play with, sometimes a gentle shower is all that is required other times you may like to imagine the power and invigoration of a waterfall of light cascading from the heavens! As you visualize the shower, cycle through the spectral colors; red, orange, yellow, green, blue, indigo then violet. Once you have completed the colors of the spectrum imagine a final shower of pure white light and then close the meditation after allowing a few moments for your senses to tune back to the here and now. I often use this meditation in the shower. 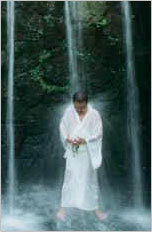 As you feel the water flowing over your head you close your eyes and visualize the water as pure light. It is very effective for me. Try it sometime!